After Pilsen coffee shop Bow Truss was twice plastered with anti-gentrification signs, 25th Ward candidates weighed in on the gentrification trends in the neighborhood. PILSEN — The gentrification debate in Pilsen isn't one that was sparked by one coffee shop popping up on 18th Street. It's been brewing for a long time, probably 50 years, 25th Ward aldermanic candidate Roberto "Beto" Montano said. "This has been coming up since the 1960s, they've been talking about this as long as I can remember," said Montano, a financial advisor who used to serve as chief of staff for incumbent Ald. Daniel "Danny" Solis. Still, in January, the issue resurfaced, this time manifested in anti-gentrification signs that were plastered over the windows at Bow Truss, a coffee shop that opened in August. The next weekend, the shop was hit again, prompting the Chicago-based owner to ask those targeting his store to come forward and talk about the polarizing issue. Longtime Ald. Solis has been tasked with steering the changing neighborhood since he was appointed to the seat in 1996. The former community activist didn't have much to say about the recent anti-gentrification messages, but it's clear that he supports Bow Truss as a business. Solis recently met with a DNAinfo Chicago reporter there on a different ward issue and the coffee shop's owner Phil Tadros confirmed he stops in from time to time. Through his spokeswoman Stacy Raker, Solis said that he aims "to continue to improve our communities while keeping them affordable, great places for people to live and raise their families." "This was a guiding principle early in my career as a community activist and it continues to drive my vision for the community as alderman," he said. Solis said he remains focused on improving the neighborhood's schools and maintaining and establishing new affordable housing, including the Resurrection Project's Casa Queretaro community, now under construction. He said he balances those priorities with promoting economic development in the ward. Montano said an "evolving Pilsen" won't erode the neighborhood's Mexican roots. "I'm Mexican, but no amount of new people will erase the cultural anchors that are here, like the National Museum of Mexican Art, or the eagle at 18th and Blue Island," he said. 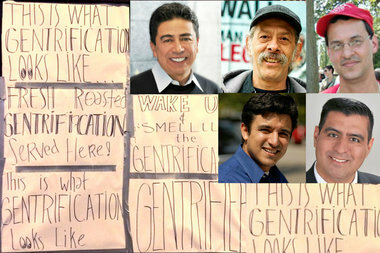 Now, gentrification has become "almost like a chic thing" to complain about, Montano said. He grew up in the neighborhood, and now lives a half-block from the church where he was baptized. "Some of the people who are crying gentrification, a lot of them [moved into the neighborhood] a half-century ago," he said. "So we have new people screaming. Who are we to tell people they can't come to Pilsen?" But the real issues behind the complaining — rising property taxes and rents — are valid concerns, Montano said. When it comes down to it, the gentrification of Pilsen is a class issue, not a race issue, he said. "What I think people are saying, the intention behind the argument, is when a community is improving, property taxes go up," he said. "When taxes go up, the cost is passed through to renters in the form of higher rent." Montano said he previously led a team to create the Pilsen Historic Landmark District, that led to a freeze in property taxes for eight years. Many other affordable housing issues Montano believes can be addressed on a "house by house, block by block" basis. Businesses like Bow Truss — that fill a storefront and hire locally — should be welcomed, Montano said. "Thank God for Dusek's and Thalia Hall," he said. "I love the fact that Pilsen is in a resurgence and I love that real economic development is driving public safety." Candidate Jorge Mujica said gentrification is "absolutely" a real problem in the neighborhood, and he's seen many locally owned, Latino-owned businesses in the neighborhood shut down. "Everything new we see is people coming from outside the ward and creating high-end [stores], or Dunkin Donuts, Subway instead of the usual Latino-owned family businesses," Mujica said. "Danny Solis is trying to create a Mexican district without Mexicans." Mujica, a labor and immigrant rights organizer, said Census numbers show that thousands of Mexicans have left the neighborhood, and leaders must work to reverse that trend. The Socialist candidate said he doesn't know exactly how he'd address the symptoms caused by gentrification, but he would start by listening to the longtime residents living in the ward. He would try to tap into ward funds to create a revolving loan fund for homeowners, too. "I'm convinced that we can help families even [in small ways], by helping them even helping them apply for Small Business Administration loans and [other] government loans," Mujica said. CPS teacher Ed Hershey said the working people who form the neighborhood's base feel increasing pressure from rising rents and are being ousted by developers who want the hot neighborhood's real estate. "I see how fancy coffee shops become a flashpoint for that," Hershey said. "Improving the neighborhood does mean driving working people out. Pilsen's gentrification has been slow, because people have fought against it." If elected, Hershey would consider expanding public housing options and rent-controlled properties. While he would support businesses, he wouldn't give corporations "handouts" to locate in the ward. The anti-gentrification activists who plastered Bow Truss anonymously aren't voicing their discontent in the right way, said Byron Sigcho, lead instructor at UIC's Center for Literacy and a Pilsen Alliance board member. "However there must be a dialog about these problems," Sigcho said. Thousands of Latinos "have left the neighborhood and the lack of the conversation, the dismissal of the problem, is frustrating." Sigcho said that he would use public resources to address the community housing concerns instead of subsidizing businesses. He would dedicate more resources to create affordable housing, too, he said, and support a progressive income tax. "A higher minimum wage alone won't solve the problem. We need to bring the money to the community and invest in good schools and good community programming," he said. 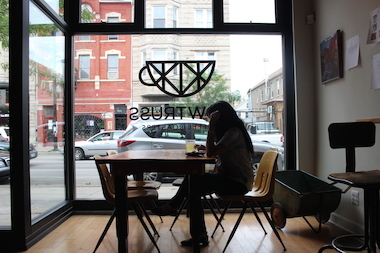 Sigcho said businesses like Bow Truss want to open in the neighborhood, but leaders have a responsibility to ensure the people living in Pilsen can afford the store's commodity — in this case, coffee. For now, Tadros said the store has added a $1 coffee option to address the cost concern. The normal Bow Truss cup ranges from $2 to $4, he said. Tadros said he never expected to be the target of the neighborhood's anti-gentrification message when his Bow Truss business — and the cost of coffee — is designed to treat coffee farmers fairly. "We are a local small business," Tadros said. "It's interesting for me to have [people calling the coffee] over-priced. We have direct trade agreements with farms in Mexico and other countries, so they can take better care of the farms, their product and pay people properly." Tadros also owns Bow Truss coffee shops in Lakeview and River North, with plans to open two more stores in Logan Square and the Loop. While the candidates are vying for a chance to represent the entire 25th Ward — which includes Chinatown, the West Loop, Little Italy and Heart of Chicago — all five call Pilsen home. The election is Feb. 24.